Do you want to enjoy delicious lattes, espressos and cappuccinos anytime in the comfort of your home? The DeLonghi Magnifica ESAM3300 is a compact super automatic espresso machine that is remarkable for the rich set of features available in a small package and also noted for its great reliability and simplified maintenance. This compact super espresso machine is the ideal choice for a smaller kitchen or counter when you want great drinks and big features in a small package. Featuring a 1 touch foam system, a built in burr grinder, and an easy to use digital control panel with fully programmable settings, preparing your favorite espresso or coffee drink with it is a breeze. Better yet, cleaning it is very simple as well, and the machine includes a removable and easy to clean drip tray and coffee bin. It also has a decalcification indicator. The Magnifica ESAM3300 (View on Amazon.com) is the ideal solution for those who appreciate the taste of 5 star quality coffee and want nothing but the best. The Magnifica has a patented Cappuccino System which makes it super easy and convenient to prepare lattes and cappuccinos with a rich, creamy froth created by mixing steam and milk to create perfect drinks every time. This machine has 15 Bar Pump Pressure to ensure it’s easy to produce perfect drinks with authentic flavor every time. DeLonghi’s patented Direct-to-Brew System grinds beans instantly just as they are needed for the freshest espresso. The easy-to-maintain Magnifica’s brewing system is both compact and removable for easy cleaning. This machine has a Decalcification Indicator to show you when it’s time to descale the machine, and it has a large (60-ounce), removable water tank, drip tray, and used coffee container which are easily accessed. It has an easy-to-use control panel with both Rotary and push button controls to provide programmable menu settings for coffee strength (5 settings) and cup size with rotary dial (4 settings). The conical low-pitch burr grinder is adjustable in terms of the fineness of the grind and works with all types of beans. The Height Adjustable Coffee Spout accommodates everything from small espresso cups to large cappuccino glasses. It has a Hot Water Spout, which is great for tea and hot chocolate! The Magnifica has a 3 hour automatic shut-off to save energy and minimize maintenance. DeLonghi’s Double Boiler System means you needn’t wait between preparing espresso and cappuccino. The DeLonghi Magnifica really excels for professional quality. Reviews from purchasers consistently call out both the quality of the machine and of the drinks it produces—which are consistently fresh and aromatic. The Magnifica maintains ideal temperature for brewing, which means no waiting for your next cup of pleasure. Indicative of the quality and full features of this machine, it has a Cup Warmer to preheat your cups. It has a Limited 2 Year Warranty. In summary, it’s easy to see why the DeLonghi Magnifica ESAM3300 is such a popular machine. With its compact design it has super features, makes great drinks, and is quite reliable. It has all the features you want to deliver cup after cup of delicious espresso. If you go online and read reviews, you’ll notice that the ESAM3300 is one of the least returned espresso machines on the market. This matches our experience. The ESAM3300 is definitely one of the most reliable super automatics available. Easily adjust coffee strength and cup size to meet your needs. All you have to do is push a few buttons on the front control panel and you’ll be able to easily brew the perfect cup of coffee. DeLonghi knows that cleaning an espresso machine is very time consuming in general. That’s why they designed the ESAM3300 in such a way that you can easily remove the parts that need cleaning and then clean them fast. The dialed controls are of the highest quality compared to touch or digital dials and will provide ease of use with exceptionally long service life. The ESAM3300 features a bypass doser, which allows using pre-ground coffee and which is extremely rare for a machine in this price range. The grinder, while super quality and efficient, can be a little noisy can be a bit noisy. Oily beans can sometimes clog the cute from the bean bin. This is common among similar machines. First of all, it’s important to note that the Magnifica ESAM3300 is very attractive priced for a machine with so many features. If you’re someone for whom the taste of espresso, including cream, aroma, and flavor are very important in order to start the day off right, then you certainly need to consider the ESAM3300. The DeLonghi Magnifica, while not including all features of $4,000 automatic espresso machines, has amazing “bang-for-the-buck”. With its compact size it is super feature rich and a great value. We thoroughly recommend this model to anyone who wants to be wowed by the impressive taste and overall coffee quality this machine can produce at a relatively low price point. DeLonghi ECAM22110SB (View on Amazon.com): The DeLonghi ECAM22110SB is a bit more expensive than the ESAM3300 and it does have a great set of features that distinguishes it from the competition. For instance, the aroma button helps you greatly improve the aroma of your coffee drink, while the machine’s compact size allows you to use it even if you have little space available on your kitchen countertop. Given the fact it helps you save up to seventy seven percent on energy, it’s a great choice for those who care about saving the environment (and money). Gaggia Brera Superautomatic (View on Amazon.com): The Gaggia Brera features 4 filtration stages that tremendously help to minimize scale buildup while removing impurities from your water. Maintenance is a breeze as well and you’re notified when the machine needs to be cleaned. Thanks to the pre-infusion feature, the Brera can prepare coffee drinks that have a great aroma and flavor. 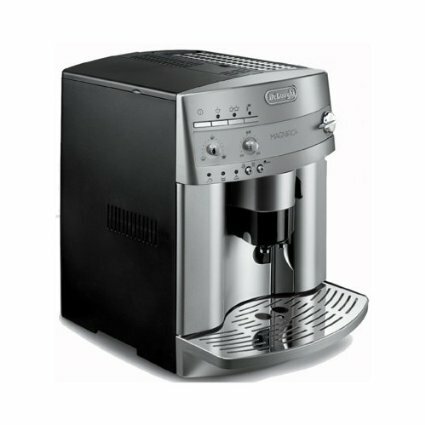 DeLonghi ESAM3500.N Magnifica (View on Amazon.com): If you’re a cappuccino lover, then the DeLonghi ESAM3500.N is certainly the right espresso machine for you. It features programmable menu settings, can instantly grind beans and there’s also no waiting time between preparing a cappuccino and espresso. Since it features a conical burr grinder (low pitch), you can rest assured that your coffee beans can be ground exactly to your desired fineness.